Jim Clemens Collection Vol.30: Remembering The Southern Part 4 (72 mins). 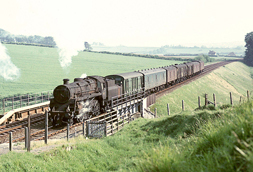 The final volume of Southern Steam memories from the JIM CLEMENS archive film collection, this time covering the Bournemouth to Weymouth section of the main line as steam came to an end. We begin with extensive footage at Bournemouth including rarely filmed freight workings and M7 0-4-4 tanks as well as the usual Bulleid Pacifics and Standard classes. The Bournemouth trolleybus system is also featured with its turntable at Christchurch. Onwards and we cover southern end of the Somerset & Dorset Joint from Templecombe to Blandford and Bournemouth West before we journey westwards through Poole and Wareham to the Swanage branch. Here we see footage from its M7 hauled days through to the Ivatts and Standards hauled era plus the last visiting steam rail tours in 1967 with Bulleid Pacifics. Travelling westwards via Wool, we reach Dorchester and visit the Maiden Newton to Bridport branch with steam hauled railtours plus coverage of the replacement DMU service just prior to closure. Finally there is a look at the Dorchester to Weymouth line with good scenes of trains on the Bincombe bank through Upwey.